The 1785 Leiper House opens for public tours on Saturday and Sunday afternoons from 1 to 4 for the rest of the year. No appointment necessary. No charge, but donations welcomed. 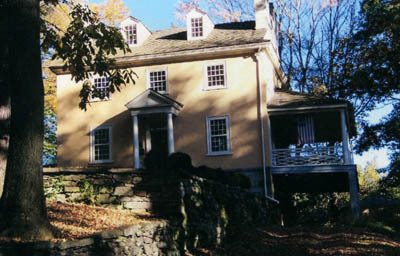 The 1785 summer home of Revolutionary War Patriot, Philadelphia Council President, early merchant and railroad pioneer, the Thomas Leiper House is located above Crum Creek on Avondale Road. This fine example of Federal Period architecture (1785) was rescued from demolition through the joint efforts of Historic Delaware County, Inc. and Nether Providence Township. It is now maintained by the Friends of the Leiper House, Inc. and the Township. The house is furnished with circa 1800 antiques, including some Leiper family pieces. Its four remaining outbuildings have been restored. Displays throughout the house illustrate the many roles Thomas Leiper played in the development of southeastern Pennsylvania. The house is open every Saturday and Sunday from noon to 4 p.m. from April through December each year. Guided tours are provided. Membership in Friends of the Leiper House is open to anyone interested in the restoration and preservation of the property. For more information, call the Leiper House at 610-566-6365.